Welcome to Jesus is Born! 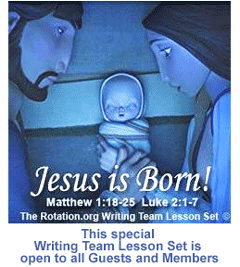 ...another great Sunday School lesson set from the Rotation.org Writing Team. This particular Writing Team set is open to the public to give visitors a flavor of what the Writing Team lessons are all about. Free registration is required to view it if you're not already registered. To get access to all other Writing Team Lesson Sets you will need to become a Supporting Member. 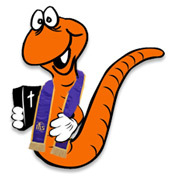 Guests and members: Don't forget to visit our other public Advent lesson forums as well. Jesus is Born! covers Matthew 1:18-25 and Luke 2:1-7 --The Angel's Announcement, Caesar's decree, Journey to Bethlehem, Birth in the manger. This special set is open to everyone. If you're not already a Registered or Supporting Member, you need to register for free to see the Jesus is Born! lessons. Want access to all the Writing Team's extra-special lesson sets? Become a Supporting Member today.